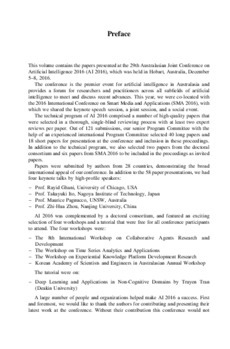 This volume contains the papers presented at the 29th Australasian Joint Conference on Artificial Intelligence 2016 (AI 2016), which was held in Hobart, Australia, December 5� 2016. The conference is the premier event for artificial intelligence in Australasia and provides a forum for researchers and practitioners across all subfields of artificial intelligence to meet and discuss recent advances. This year, we were co-located with the 2016 International Conference on Smart Media and Applications (SMA 2016), with which we shared the keynote speech session, a joint session, and a social event.